The migrations of Pacific predators resemble those of African wildlife. Blue whales are among the Pacific predators whose large-scale movements have been tracked. They dine on small crustaceans called krill, and, like some “nomadic” African lions, migrate to where their prey is seasonally abundant. "The dugout canoe does not know the depth of the water” (Umubindi ushira uvimye). So say the Hangaza, a group of more than 150,000 people who live along Lake Victoria, west of Tanzania’s Serengeti National Park. The proverb rings true: floating on the water won’t tell you what is going on below. Half a world away from Tanzania, along the United States West Coast, oceanographers are finding new ways of looking beneath research vessels that ply the Pacific. They’re getting a fish’s eye view of the deep by placing electronic tags on predators such as blue whales and California sea lions, yellowfin tuna and white sharks. As the data come in, their thoughts turn to the Serengeti. Their project is called Tagging of Pacific Ocean Predators (TOPP). It focuses on certain areas of the Pacific, among them the California Current, an undersea river of water that flows south along the western coast of North America, beginning off British Columbia and ending near Baja California. The current supports large populations of whales and seabirds, and fuels important fisheries. Its productivity comes from an upwelling of cold subsurface waters, caused by prevailing northeasterly winds. The chilly waters ferry a steady supply of nutrients to the surface. The scientists are also studying an area called the North Pacific Transition Zone, the boundary between cold subarctic water and warm subtropical water, about halfway between Hawaii and Alaska. 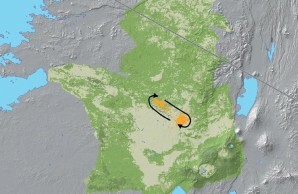 It’s a major trans-Pacific corridor for the movements of predators and prey. 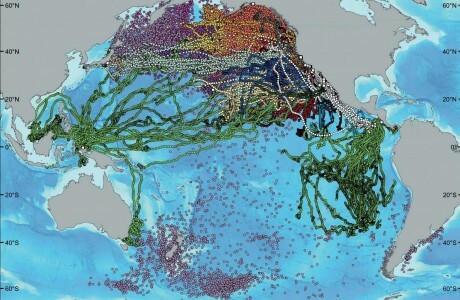 Combined map shows movement patterns of twenty-two species documented by scientists collaborating in the TOPP (Tagging of Pacific Ocean Predators) project. “These are the oceanic areas where food is most abundant,” says marine scientist Barbara A. Block of Stanford University’s Hopkins Marine Station in Pacific Grove, California. “They’re the savanna grasslands of the sea.” Knowing where and when species migrate is critical information for managing and protecting ecosystems, says biologist Daniel P. Costa of the University of California, Santa Cruz. TOPP was launched in 2000 by Block and Costa along with Steven J. Bograd of the National Oceanic and Atmospheric Administration’s Southwest Fisheries Science Center in La Jolla, Randall E. Kochevar of Stanford, and others. The project was part of the Census of Marine Life, a ten-year-long investigation of the diversity, distribution, and abundance of ocean species. 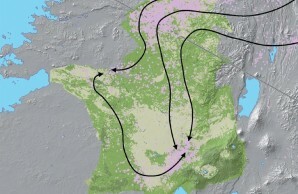 TOPP became the world’s largest “biologging” (electronic tagging) study, involving more than seventy-five biologists, oceanographers, engineers, and computer scientists in eight countries. A decade of findings were reported in the journal Nature in June 2011. They reveal that the migrations of twenty-two marine species overlap. Block, Costa, and their colleagues use an array of technologies to track species and to record such environmental variables as water temperature, salinity, and depth. 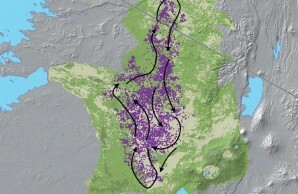 The TOPP project alone deployed 4,306 satellite-monitored tags, yielding a massive amount of data. Scientists spent two years synthesizing data sets. They discovered intersecting ocean hotspots and highways of life—and learned much about how marine conditions influence where animals hang out. The results show that many migratory marine species, like animals on the Serengeti grasslands, return to the same regions each year, homing in with astonishing fidelity to the places where they were first tagged. “It’s akin to a student from London studying in far-off Rome and coming home each summer at the same moment—but doing it all in the dark without a map or compass, using only his or her internal sense of position and direction,” says Costa. Leatherback sea turtle: Two populations have been observed, one whose females travel to lay eggs along beaches in the eastern Pacific, another that prefers western Pacific beaches. Leatherback sea turtles, for example, travel huge distances between their nesting and feeding sites. In the Pacific Ocean, contingents from two populations of leatherbacks make their way each year to beaches along the eastern and western Pacific, respectively, to lay eggs. (An individual female will nest once every two or three years.) Helen Bailey of the University of Maryland Center for Environmental Science placed tracking devices on 135 leatherbacks’ shells. Leatherback turtles in the eastern Pacific were tagged at their nesting sites in Costa Rica and Mexico; western Pacific turtles were tagged at nesting sites in Indonesia and on their foraging grounds off the coast of California. The instruments transmitted satellite signals each time the turtles surfaced. make them vulnerable to changes that might occur in the abundance of jellyfish,” says Bailey. “Being caught in fishing gear also poses a greater risk to this population because it has a smaller range than western Pacific leatherbacks.” Entanglement in fishing gear is believed to be a major cause of death in leatherback sea turtles. 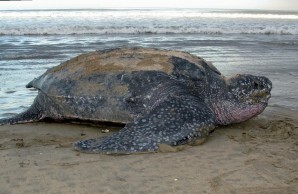 James R. Spotila of Drexel University, a coauthor of the paper, notes that leatherback turtles are long-lived animals that take a long time to reach maturity. Because the species’ numbers are declining very fast, he considers it critical to take measures so they don’t go extinct. In the past thirty years, leatherback numbers in the eastern Pacific have dropped by 90 percent. 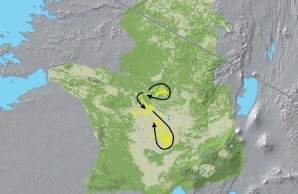 Information on the turtles’ movements will help scientists determine where fishing should be limited at certain times of the year, says Bailey. A good precedent is a decision made in 2010 to close a swordfish and thresher shark fishery off California from mid-August to mid-November. That may have dramatically reduced incidental leatherback catches. Water temperature is key to the seasonal migrations of many North Pacific Ocean species. That’s especially true in the marine ecosystem defined by the California Current, where whales, sharks, tuna, seals, seabirds, and turtles migrate each year. Like the African savanna, says Costa, the Pacific Ocean has a “Big Five”: he compares great white sharks to lions, bluefin tuna to leopards, blue whales to African elephants, leatherback sea turtles to black rhinos, and elephant seals to Cape buffaloes. Scientists see parallels between migration patterns of prey, predators, and scavengers in East Africa’s Serengeti region and movements of species in the Pacific. Mapped here are (top left and right) zebra and wildebeest, (middle left and right) nomadic lion and hyena, and (bottom) vultures. Most lion prides occupy defended territories; nomadic lions, usually single males, tend to follow migrating herds while trying to avoid detection by resident males. Some predators spend their lives in the California Current, but others migrate long distances across the Pacific Ocean to reach the current’s abundant prey, including krill, sardines, anchovies, and squid. “Why a young bluefin tuna less than two years old wakes up in the light of the Japan Sea and decides to swim to Baja is unknown,” Block says. “But once it arrives, tagging data indicate that it lives there for years, taking advantage of the rich ‘forage’ along the coast.” Many species—including black-footed albatrosses, sooty shearwaters, bluefin tuna, and salmon sharks—migrate more than 1,200 miles from the western, central, or southern Pacific Ocean to reach the California Current’s rich food resources. Farther off shore is the mysterious White Shark Café, as it’s known, an open-ocean winter and spring habitat for otherwise coastal great whites. The area, halfway between Baja California and Hawaii, hadn’t been a suspected shark hangout. But when scientists mapped data from satellite tags placed on 179 great white sharks between 2000 and 2008, they discovered that the sharks frequently travel to and loiter there. While at the café, they dive to depths of 1,000 feet as often as once every ten minutes, according to Salvador J. Jorgensen of Stanford’s Hopkins Marine Station. He and colleagues published their results online in November 2009 in Proceedings of the Royal Society B. Coming mostly from rookeries along the Pacific coast, the great whites take up to 100 days to arrive, traveling at about two knots. The study showed that the sharks adhere to a rigid route of migration across the sea, returning to exactly the same spot. Since both male and female sharks have been tracked to the café, an early hypothesis was that it could be the undersea equivalent of a trendy pickup bar. Further studies, however, revealed that juvenile sharks also make their way there. The purpose of the deep dives is not yet known, with the great whites lingering, often for months, in what seems to be an oceanic “desert” where food is scarce. Michael L. Domeier of the Marine Conservation Science Institute in Fallbrook, California, hypothesizes that the predators are feeding not on fish but on giant squid. 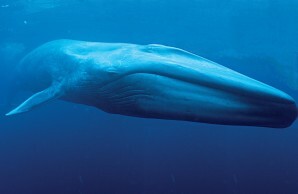 Sperm whales, which feed on giant squid, are sighted in that area. Tracking other species, such as tuna, may help explain how the shark café came to be. “We’re only beginning to understand what it means to have the equivalent of lions in the ocean wilderness off California,” says Block. Tuna, sharks, and blue whales may be cued to seasonal changes in chlorophyll concentrations,” says Bograd. Chlorophyll indicates the presence of phytoplankton, the grasslands of the sea. 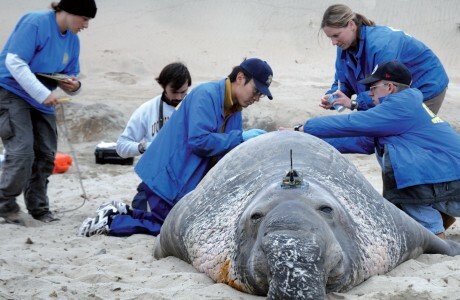 Marine scientists work with a lightly anesthetized male northern elephant seal. After using fast-acting epoxy to glue a telemetry tag to the hair on the animal’s head, they measure blubber thickness with an ultrasound device and collect blood samples. Elephant seals, for example, are drawn to a particular oceanographic feature—a boundary zone between two large rotating currents, or gyres. Along this boundary, the cold nutrient-rich waters of the subpolar gyre in the north mix with the warmer waters of the subtropical gyre to the south, driving the growth of phytoplankton and supporting a veritable feast of marine life. An oceanic surface feature linked with the boundary zone and caused by blooms of phytoplankton is visible on satellite images. It moves seasonally by as much as 600 miles, however. Some elephant seals don’t follow; they continue to target the deep boundary zone between the two gyres. Using data from nearly 300 tagged animals, Costa showed that the elephant seals travel throughout the northeast Pacific Ocean on foraging trips in search of prey such as fish and squid. “For the first time, we can truly say that we know what elephant seals as a population are doing,” he says. The results were published in May 2012 in the journal PLoS ONE. A small number of elephant seals search for food in coastal regions, pursuing bottom-dwelling prey along the continental shelf. Among these is a female that feeds near Vancouver Island. She holds the record for deepest recorded dive by an elephant seal: 5,765 feet, more than a mile down. 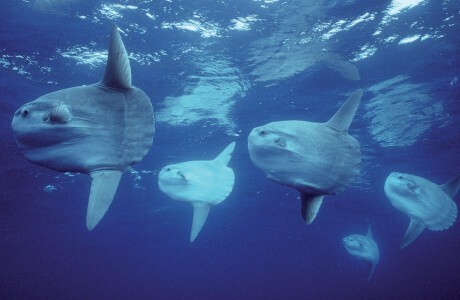 The ocean sunfish, or common mola, is known to dine on jellyfish, but its diet may be far broader. One new project, called WhaleWatch, is looking at how to reduce the number of whales entangled in fishing gear, by identifying the areas whales are most likely to visit. Satellite tags have been attached to gray whales and to three other whale species—blue, fin, and humpback—off the U.S. West Coast. WhaleWatch scientists such as Bailey are using satellite data and migration models of gray whales to identify high-risk areas for the whales, and to develop conservation policies for reducing ship strikes and entanglements. Among whales, the gray is the West Coast species most often hit by ships and caught up in fishing gear. Gray whales are known for long migrations of more than 10,000 miles from their feeding grounds in the Bering Sea to breeding areas along the coast of Baja California, Mexico. WhaleWatch researchers are analyzing gray whale satellite tracks to determine where the hotspots are for these whales. Along the U.S. East Coast, humpback whales, also long-distance migrators, are frequently ensnared in fishing gear. This July, scientists at the Provincetown Center for Coastal Studies in Massachusetts freed a whale caught in fishing line wrapped around its mouth and head. The researchers are part of a team following satellite-tagged humpbacks in the Gulf of Maine. The snagged whale is one often seen in local waters. A mark on its tail fluke is shaped like a giraffe, giving the humpback its name: Serengeti.